I want to like coffee. I'm one of those losers who orders a skinny hot chocolate or peppermint tea at Costa and instantly feels less mature than my twenty-six years! Sigh. Saying that, I do like coffee cake. Naturally. In my quest to make fewer chocolate cakes (so far I've managed carrot, lemon and blueberry and lemon and poppy seed among other less blog-worthy bakes) I plumped for a coffee and walnut cake when asked to make something for father's day. You can find the recipe I used here. The great thing about using liquid coffee in the mixture is that it makes the cake super moist. I used regular instant coffee and although the cake definitely had a coffee flavour, it wasn't as full-bodied as it would have been using espresso coffee as the recipe suggested. As usual, the recipe quantities of icing made way more than I needed, but I popped the excess in a tupperware and froze it - I often do the same with cream cheese frosting which once thawed, works just as well second time round. I told my nephew the walnuts on top were teeny tiny brains. Fortunately he's too young to understand! It looks great! It's been donkeys years since I had coffee and walnut cake. I can't stand coffee cake but adore coffee- I'm definitely going to try and make my own soon! I have only recently started to like coffee- but will always order a vanilla late or a mocha frappacino rather than straight coffee! 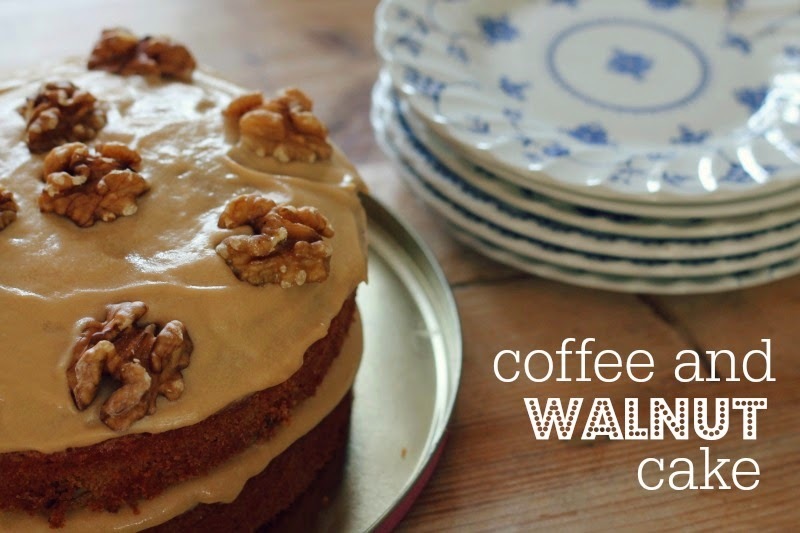 Coffee and walnut cake is one of my absolute favourites! What a lovely looking cake! I also really dislike coffee (I've tried and tried over the years but it always makes me screw up my face!) but love coffee cake and tiramisu. I love the idea of eating coffee and walnut cake with strawberries - such a good flavour combo!